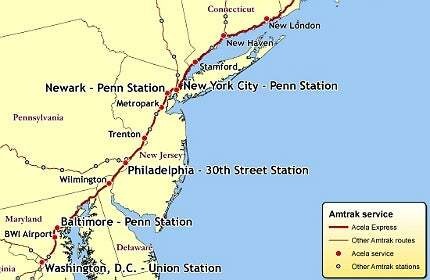 US rail operator Amtrak recently unveiled a grand $151bn vision to prepare the Northeast Corridor for a high-speed future. But with the American economy facing unprecedented challenges, is such a costly plan realistic? Chris Lo delves into the details of the scheme to find out. Amtrak's plan culminates in full NextGen high-speed rail services between Washington D.C. and Boston by 2040. Image courtesy of Michael Kurras. The Northeast Corridor links the most economically powerful cities on the US East Coast. Image courtesy of kmf164. The mix of higher-speed Acela trains with slower commuter services on the NEC is a major challenge for future upgrade projects. Image courtesy of John Mueller. Amtrak's proposed $7bn Washington Union station upgrade has been criticised as excessively expensive. Image courtesy of Amtrak. Developments in the last few years have left US high-speed rail supporters with little to smile about. President Obama’s ambitious plan to create 13 high-speed rail corridors in 31 US states is now virtually dead in the water, with Republican governors in Wisconsin, Florida and Ohio rejecting federal money for major high-speed lines based on concerns about overspending and inadequate ridership levels. At this point, the only US regions with hope left for high-speed projects are California, where Governor Edmund G. Brown last month signed a $4.7bn initial funding bill for a high-speed project that would eventually link Los Angeles and San Francisco, and the Northeast Corridor (NEC), a bustling but aged East Coast rail network that takes passengers from Boston in the north, through New York, Philadelphia and Baltimore to Washington D.C. in the south. At present, the NEC’s chaotic multimodal mix of commuter, regional and freight services are approaching a capacity crisis, and with more than 50 million residents occupying a region that represents only two percent of the country’s total landmass, congestion on the NEC is only going to get worse. To address these capacity concerns, Amtrak, the government-owned rail operator that owns the majority of the NEC, recently unveiled its grand vision for the future of the network. "Several components of the plan have been criticised as unreasonably expensive compared to comparable projects." As Amtrak’s recent vision document for the NEC points out, congestion on the region’s rail network poses a threat to economic development; a big problem that requires an equally big solution. "Without a change in focus to address future capacity needs, the existing transportation network will likely present a significant constraint to future growth and economic development in the region." Amtrak’s capital investment plan proposes a raft of major changes for the NEC, with a scope leading up to 2040. To secure higher capacity and reduced journey times between cities in America’s most powerful mega-region, the operator plans to spend an astonishing $151bn to overhaul the network. Up until 2025, the network would undergo massive upgrades to its existing services, with 40 more Acela Express high-speed passenger cars introduced to increase Acela capacity by 40%, the doubling of services between New York and Washington and two new tunnels under the Hudson River, to improve access to New York. While the infrastructure expansion and procurement required for these steps is immense, they are only the opening act for the next step of Amtrak’s vision: to introduce next-generation high-speed rail (NextGen HSR) services between all of the region’s major urban centres. The New York-Washington express service would be planned for completion in 2030, with a New York-Boston line set to follow in 2040. The completed 437-mile high-speed line would allow trains to travel at up to 220mph, significantly reducing journey times between all the major cities of the north-east coast. "Much of today’s NEC rail infrastructure was built a century ago by visionaries whose work helped move a nation and propel us into greatness," wrote Amtrak president and CEO Joe Boardman in his introduction to Amtrak’s vision. "For America to be globally competitive in the coming years, we must be equal to the challenge before us, and be daring to think big." Amtrak’s $151bn proposal: a worthwhile investment? Few would deny that Amtrak’s plan for the NEC is a compelling vision for rail transport in the region. But now that the dust has settled on the proposal, critics and analysts are focusing on whether this massive scheme is feasible under the current political and financial climate in the US. "Amtrak’s Stephen Gardner has acknowledged that there is currently no federal money dedicated to the project." From a political standpoint, there is certainly an element of hopeless optimism about Amtrak’s ambitious plans. The Republican party, which currently dominates the US House of Representatives and is well-positioned to consolidate or expand its position in Congress after the upcoming election, has traditionally taken a dim view of high-speed rail. The rejection of high-speed funding in states like Wisconsin and Florida has been predominantly Republican-led, as was the axing of President Obama’s $53bn high-speed rail proposal in November 2011. Furthermore, with the US national debt numbering in the trillions of dollars, the likelihood of Amtrak getting any federal commitment on a project that costs more than $150bn seems remote. The potential for political hostility to Amtrak’s plan is reflected in its phased financial model, which calls for an outlay of $3-4bn a year during peak years of construction, as well as delaying some spending until after 2040, when estimated ticket revenues of nearly $5bn a year from a predicted 43 million passengers (and a $928m operating surplus) would help with financing. Amtrak’s VP of NEC infrastructure and investment development Stephen Gardner has acknowledged that there is currently no federal money dedicated to the project, but still emphasised the importance of support from the federal government, which would need to pay around half of the project’s cost. "It’s clear to me that it will take every level of the public sector and new involvement by the private sector to do this," he told the Philadelphia Inquirer. "The federal piece is the lynchpin." "The NEC’s chaotic multimodal mix of commuter, regional and freight services are approaching a capacity crisis." Even with all this pessimism, there is some light at the end of the project’s very long tunnel. For a start, the project promises to make a short-term impact on the north-east economy by generating 40,000 construction jobs a year for 25 years, as well as creating 22,000 permanent jobs, an immense boost to the regional economy even without considering the economic benefits of improved rail transport. If Amtrak can use these statistics to carve their funding out of the federal budget, evidence from other high-speed projects around the world, where these lines have helped to tie regional economic hot-spots more closely together, to the benefit of all. An article produced by Philadelphia University’s esteemed Wharton School in its online journal Knowledge@Wharton cites the success of the UK’s high-speed rail schemes to improve links between London and the Midlands as a paragon of high-speed’s economic virtues. As an economic ‘enabler’, the article argues, Amtrak’s proposals could do the same for the NEC. "If we could provide high-speed service here, it would unite, for instance, the Philadelphia economy much more closely with the New York economy, to the benefit of both," said Marilyn Jordan Taylor, dean of the university’s School of Design. Critics of Amtrak’s plan argue that even if the benefits of high-speed rail in the north-east region were certain, there are ways of going about introducing it without that staggering $151bn price tag. The Economist’s Gulliver business travel blog notes that, on top of the problems Amtrak would have in getting funding from a Republican-led US Congress, other major hurdles include US safety regulations, which require American passenger trains to heavier and costlier than their European or Asian counterparts. Gulliver also notes that the NEC’s track infrastructure, which includes overlapping commuter lines, an inadequate tunnel system in Baltimore and major, train-slowing curves in its route, makes Amtrak’s plan all the more unrealistic. Several major components of the plan have also been attacked for being unreasonably expensive compared to comparable projects around the world. In Philadelphia, for example, Amtrak’s scheme calls for a ten-mile tunnel to be bored underneath the city; the tunnel’s $10bn cost would eclipse even that of the Gotthard Base Tunnel, which involves more than 90 miles of tunnels being bored underneath the Swiss Alps, according to travel blogger Steve Stofka. Union Station in Washington DC, US, is a historic landmark and one of the largest railway stations in the world. Similar cost concerns have been raised about the proposed $7bn upgrade of Washington Union Station in Washington D.C. to prepare it for future capacity and the introduction of NextGen HSR services. Slate’s business and economic correspondent Matthew Yglesias calls the project "insane", noting that the high-speed upgrade to London St. Pancras station cost a fraction of this amount at £800m. Yglesias also accuses the plan of spending huge sums on aesthetic improvements with "minimal operational value from the standpoint of actually operating a railroad". Joe Boardman, Amtrak president, promised to think big on the NEC project, and the rail operator has done exactly that. But while high-speed rail would undoubtedly bring benefits to the north-east region, in a period of economic uncertainty and conservative politics, perhaps this grand $150bn public transport vision has been mistimed. A more modest outline for infrastructure improvements leading to NextGen HSR would surely have a much better chance of actually coming to pass than a plan that calls for $7bn to be spent on a single station. After all, to borrow a common piece of folk wisdom, a bird in the hand is worth 150 billion in the bush. Train stations around the world are approaching full capacity, as passenger numbers grow and cities are linked with new rail lines. From Zurich Hauptbahnhof to Shinjuku Station, railway-technology lists the world’s busiest stations. The Obama administration’s $13bn investment in high-speed rail links is a huge change of direction for the US. Alex Hawkes investigates if such a policy could be jeopardised by America’s tentative past-relations with rail.